Over almost the past year, I’ve been looking into better tech training options for the production volunteers at National Community Church. It’s a little bit of a challenge to keep my volunteers up to speed because the turnover rate in the Washington DC area is so high. As all church tech guys know, running tech for an event is not only a learned skill, but an art…sort of like playing a musical instrument. 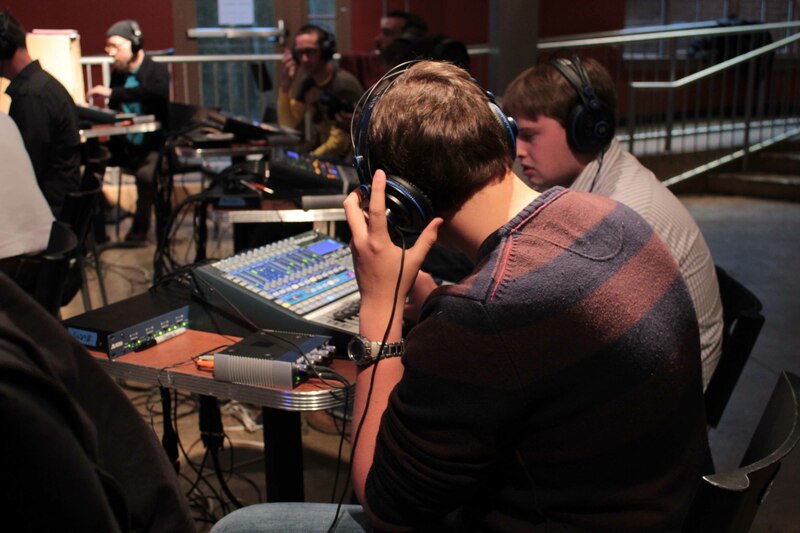 Anyway, since NCC is multisite, I was looking for a great way to do some hands-on mix training where the volunteers could just hang out and take the time to learn and play with what the mixing console controls do, how EQ works and reacts…basically, run sound with no pressure! So, I contacted a friend of mine from Worship MD named Doug Gould. Doug has had a background in audio for many years including working for companies like Shure and now his company helps to market brands like Audio Technica, Aviom, Presonus, Planet Waves, Ultimate Ears, Vox, and Waves plug-in’s. Doug brought in six Presonus 16.0.2 consoles which we fed with signal from a full band through Aviom I/O and a master Presonus 24.4.2 console. 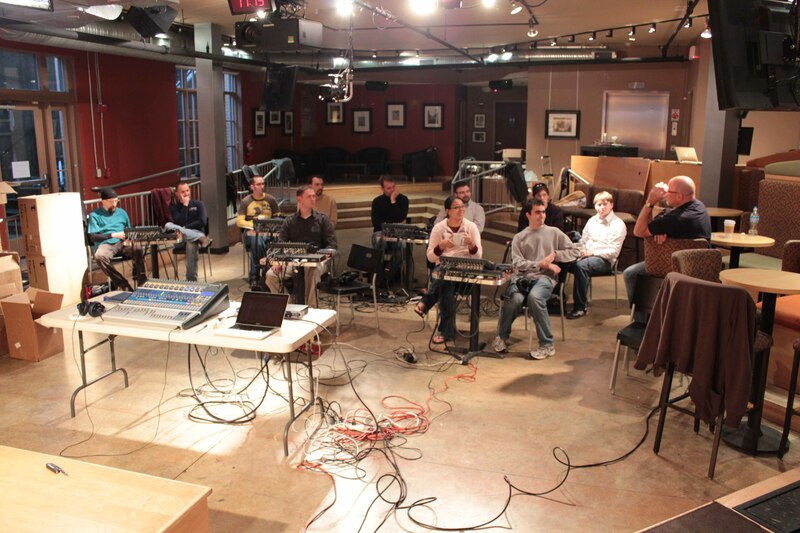 Doug talked through gain structure, signal flow, EQ, compression, and other mix basics that would benefit church techs. Then, we turned the volunteers loose on the consoles with some tracks playing and gave them time to mix full band stuff with the Presonus console. They were able to experiment with gain structure, EQ, compression, and gating. It was really critical since NCC is multisite and there’s alot of pressure to get the mix and all the production gear set up and simply GO! 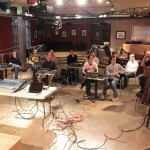 They were able to try new things, experiment, create a mix in a relaxed environment and get instant feedback and critique. 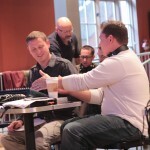 NCC will certainly be using Doug and Worship MD in the future for some of the training we will be doing. Here’s a few pictures from the event we held at Ebenezers Coffeehouse on Capitol Hill in DC. A TON of Easter eggs and this is not even half!! This past Sunday, I lead worship at National Community Church’s Potomac Yard and Gala locations. I was given the opportunity to do that because one of our staff worship leaders and campus pastors were sick. As a result, I was given the opportunity to jump in a lead worship for a Sunday AM service as well as Sunday PM service and two different worship teams. It was a great opportunity, but it was also a weird flip-flop of roles and responsibility. I am on staff at National Community Church as the Production Coordinator and I oversee production at all six locations and I’m always the guy standing in the back of the room with the production crew. Usually, I am only on stage when something is broken or not working! My degree is in Music Performance from Valley Forge Christian College but about half way through my degree, I took a detour and went down a different path and started getting more and more into production. It was a great thing for me because I was able to get perspective from the other side of the mic and better assess issues that need to be worked on or improved in the technical aspect of our services. Also, there are things that I can tighten up with coordination of making sure technical gear is where it needs to be and is functioning properly. It also takes the things I say to another level. For example, as a production tech, I would ask the worship leader and worship team to trust the production crew and trust that what they were doing was for their benefit. Now, as the worship leader behind the mic, I had to trust that my production guys were doing the right thing. That was not a time for me to try to coach them through production, it was a time for me to firmly put my trust in them and back them on their decisions and their methods for making everything happen. If I had decided to coach the production crew through everything while still in the worship leader role, I would have been sending a bad vibe for how a worship leader should treat the production crew. While everyone does need to work together, there is a level of trust that needs to happen. So, this was my time to practice what I had been preaching. Our job every Sunday morning, whether it is on the production team or the worship team is to create beautiful music and also an atmosphere of worship. As a worship leader, I felt like it was helpful to the production team to ask them for suggestions in what I could do differently. Sometimes, it can be awkward for a production tech to ask the worship leader to do something different publicly because he is afraid that maybe his request isn’t important enough or isn’t a big enough deal. Opening that door of communication on both sides is a great way to help improve both the production team as well as the worship team and the relationships between each other. So, for you church media guys out there, I guess my point with this whole post, is practice what you preach. Don’t say anything you can’t back up. If you want to make the rules a certain way, then you are going to have to play by those same rules too if the tables get turned. Last night, National Community Church held their All Church Celebration in the Lincoln Theater in Washington, DC. It was a great time of joining a church that meets in 6 different locations, during 9 different service times, all together as one body and one church. As for the tech sides of things, we used Big Sky Audio who we rented the audio system from. Performance systems provided the screen for us and we ran our typical Mac mini video set up through the Lincoln Theater house projection system. 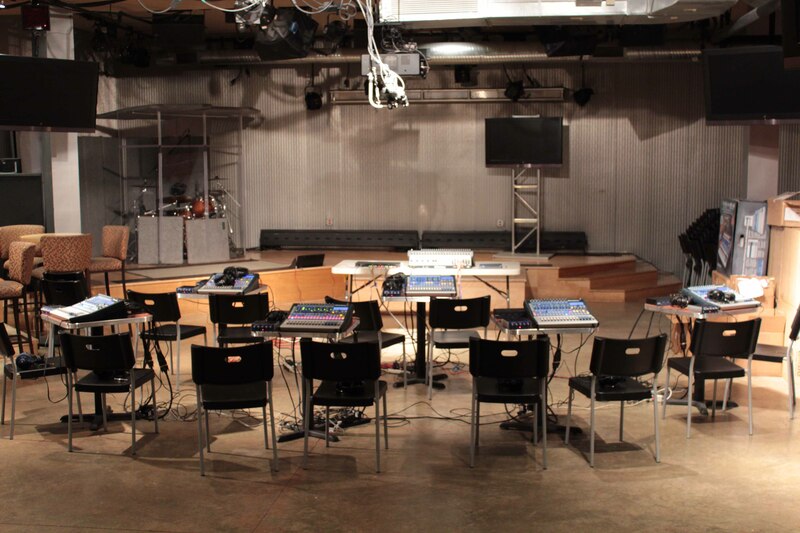 Our audio system consisted of a Midas Venice at the FOH with Avioms for onstage IEM mixing. The mains were 2 Meyer Sound MSL-4’s per side with 2 Meyer Sound 650-P’s on each side as well. The EQ was a Klark Technic DN370 which had some of the sweetest EQ filters I’ve ever hear. Unfortunately, I figured out very quickly that the sound company had underestimated the amount of sub power that we needed for the theater so we were out of luck there. There was no way the subs could keep up with the low frequency content of my mix. Overall, the main reason that we do what we do is to communicate the gospel and to draw the church together in unity and in love for one another. This event was also intended to get our whole congregation up to speed on everything that God has been doing with NCC over the past year or so and where the church as a whole is going. One thing that Pastor Mark said that really grabbed me was something along the lines of this: “God doesn’t call us to things that we are ready to do. He calls us to things that require us to fall on our knees in raw dependence of Him.” It’s a basic statement that all of us know, but need to seriously learn how to live out in our every day lives. Something else that Pastor Mark mentioned this past weekend that our frustration spiritually comes from the rhythm of our spiritual lives. We have daily rhythms that we do such as waking up, brushing our teeth, taking a shower and things of that nature. But, most of us believers are frustrated spiritually because we have a weekly rhythm instead of a daily rhythm. In order to live a live dedicated to God and following his ways, we need to always make sure we focus on getting the basic things right before we try to build on it to go higher or farther into our spiritual journey. Anyway, that’s what impacted me spiritually last night. I just want to throw up some pictures that I took with my mytouch so everyone could can get an idea of what we did last night. As I thought more about my last post which talked about Church Audio Problems, I thought I’d continue my church audio blogging by talking about a problem that has plagued churches across the country regardless of denomination or beliefs. If you have run sound for any length of time, you have probably heard feedback. And if you haven’t, I’m sure you will in the future. It can come in the form of a low rumble, a mid range “yaaaaa” sound, or a hit whistle that makes everyone want to duck for cover. (Believe me, I’ve seen it!) Feedback can be difficult to find and control because it can take different forms and be caused by different problems. First things first, we need to understand what exactly feedback is and by doing so, we can figure out what causes it. Feedback is the result of sound being cycled and recycled through the sound system. Let me explain what I mean. What happens during feedback, is that a microphone receives and amplifies sound that has come out of the speakers. The microphone sends that sound back through the mixing console to be once again amplified by the speakers creating what is known as a “feedback loop”. This can increase exponentially and instantaneously resulting in and undesirable sound we know as feedback. Now that we know what feedback is, we can dive into how it happens and figure out how to prevent it. The best way to prevent feedback is to stop it before it starts. Sometimes, it can be from a vocalist cupping a microphone, letting the mic hang at their sides, pointing the microphone towards a speaker or monitor or from improper gain structure, EQ, or processing. Let’s talk through some steps to prevent these issues. First and foremost, your sound system must have a graphic system equalizer. If you don’t have one, you should probably consider investing in one. What this allows you to do is equalize, or tune your sound system by using a series of frequency filters to adjust the intensity level of different frequencies. Spikes in specific frequencies can be caused by speaker positioning, room acoustics, or various other factors so I would seriously recommend hiring a trained professional to take care EQ’ing your system for you. That way you can be sure you’ve got everything set properly and know nothing will be damaged due to improper system setup. However, it is possible for you to do this yourself using a spectrum analyzer connected to an RTA mic. A spectrum analyzer can play reference audio through your system and the RTA mic will sense which frequencies are louder or softer then others and display them on the screen of the spectrum analyzer. This will tell you what frequencies you need to boost or cut (increase or decrease) on your system graphic equalizer. Once you get your system equalized, it will give you a good starting place and a “clean plate” to start working with. Make sure that you understand the correlation between gain, EQ, your auxes, and your fader level. Always start your sound check with your gain knob turned all the way to the left (counterclockwise position), your EQ filters at 12 o’clock, your auxes turned all the way to the right, and your fader all the way down. If the mic requires phantom power, this would be a good time to turn it on. After that, unmute your channel strip and bring the fader up to unity gain or the 0 area on the fader strip. Then, while a vocalist is either talking or singing into the mic, increase your pre amp gain until you reach your desired loudness. Using your EQ and ear, EQ the input until it sounds good. If you hear feedback, determine how high or low it is and then, using your EQ filter and your sweepable control, determine where the exact frequency is and cut it until it stops or goes away. If you experience reoccurring issues with feedback, you may need to assess mic placement or maybe even the type of mic. If you have the wrong mic for the job, or the mic is placed too far away, you won’t be getting optimal signal from it and it can cause problems in your mix. In addition, don’t be afraid to use your mute button. If a mic is not being used, turn it off. Open microphones and channels can cause excess noise in the mix and system so remember, if it’s not in use, it shouldn’t be on. 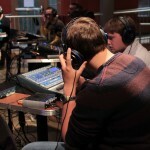 There is also outboard gear that can help with controlling mics and volume as well. If you are struggling with maintaining consistent volume of individual mics or inputs, you may need a compressor to limit the dynamic range. A compressor can usually be inserted into a signal chain at various points on the mixing console whether it is on the channel strip, audio group, mains, or even on an aux. You can also get a gate, which essentially turns a channel off when the signal drops below a certain threshold and turns back on when signal comes through. This is especially helpful in isolating individual drums when they are miced in close proximity. In any case, if you have serious, uncontrolled feedback on a reoccurring basis, you may consider seeking help from a trained professional to see if they can track down what the problem is. That way, you aren’t spending money on gear that you don’t really need and it can help you pin point the problem so that it can be assessed either by the professional or by a church sound tech. It’s important to make sure that feedback isn’t part of your worship service. Don’t let feedback become a distraction to worship or what God is trying to do in your congregation during any given service. Running sound is a huge part of making sure the message of Jesus Christ is communicated clearly and effectively. Do the best you can to improve your skills so that you can serve God with all the talents he has blessed you with and continue to invest them back into the furtherance of the Kingdom of God. If my blogs are helpful to you or your church, feel free to link back to my blog, or post links on facebook or twitter. I’d love to hear back from those of your who are reading my blogs. As many of you know, I am on staff full time at National Community Church in Washington DC as their Production Coordinator. Part of my job is to help improve production at each of our six locations and help maintain quality across those venues. I noticed one of the hardest areas to train people in and also an areas that is really hard to “get good at” is in mixing audio. I’m grateful for all the volunteers that work hard week in and week out at NCC. They are great and make it happen every week and I appreciate each and every one of them. Mixing audio is a difficult volunteer position for a number of reasons. There is alot of organization that goes into making a system work right and making sure that each instrument sounds good. Having a musical ear is very helpful in situations like this but everyone has to start somewhere. How do you begin? Well, if you are reading this, chances are you have already made the plunge and volunteered at your local church and have the opportunity to run sound on at least a fairly regular basis. Maybe there are issues that you wish you could fix, but struggle with. Maybe there are problems that you hear, but don’t have the know how to solve. I am going to go over a few things that you can do step by step to try to improve the audio in your church and more effectively communicate the gospel through technology. Okay, so most churches have a worship band. The members of that band vary but almost always include drums, bass, guitars (acoustic and electric), keyboards, and of course vocals. There are certain instruments that are simply louder then others. For example, drums, electric guitar amps, bass guitar amps and instruments of that nature tend to create what we call high amounts of stage volume. The problem with this is that when there is alot of stage volume present, it will compete with the sound coming out of the main speakers in frequency response and also time delay which causes phasing. This forces the audio engineer to attempt to mix the sound from the stage volume with the sound from the speakers. That becomes impossible when time delay phasing becomes a factor. If the sound is coming from the back of the stage and from the speakers at the same time, it will reach the listener at two different points in time causing phasing. This is almost impossible for an audio engineer to fix and creates a muddy and unclear sound. Guitar amps should be kept to a minimum or moved far enough away so as not to cause issues. Drummers, in a small room, should play conservatively and the church should consider purchasing a drum cage to contain the volume. Another issue stage volume causes is high levels of sound from some instruments make it difficult for other people to hear what they need to. They can’t hear what they need to because they are hearing too much of everything else. So, be respectful to everyone and think before you crank! Another issue that can cause stage volume is from stage monitors. When you run your stage monitors at levels that are too loud, you risk having the sound bounce around on stage and ultimately out in to the audience causing the same muddy and time delay issues that a loud instrument causes. Many musicians on stage think that in order to hear something specifically in their mix, that they need the audio engineer to turn it up more. In some cases that is true, but you, as a musician, may want to listen more closely to your monitor before asking for something to be turned up. Is there one or two instruments that are much louder in contrast to the others? If so, you may want to ask the audio engineer to turn those down before asking him to turn other things up. Try it! It works! First, you need the right microphone for the job. There are a wide array of microphones out there. But you need the right tool for the job. Check out the make and model number of your microphone and look it up online. You don’t need to understand what all the technical jargon means, just understand what the microphone’s intended purpose was and how it should be used. Once you understand the microphone’s application, then you need to set it up and position it in the right way. Way to often, I see a Shure SM57 hanging over the top of a guitar amp dangling over speaker. First of all, that mic is positioned completely wrong and is micing the floor rather then the guitar amp. You are micing indirect soundwaves which is probably introducing some type of phasing into your mix as well. Vocalists who cup mics and sing incorrectly to them are also extremely difficult for audio engineers to compensate for. When you sing, you should never cup the windscreen. This prevents frequency rejection which the mic was designed to do. It can also cause more mic pops and other breath related noises that can ruin a good sound. When you mix sound check, you must properly set gain structure for each and every input. You should start with the fader all the way down where the small infinity sign is. After making sure the gain or trim fader is turned all the way to the left, unmute the channel and bring the fader up to 0 dB. Then, gradually bring the gain knob up to the desired loudness. Then, EQ the channel and mix your monitors. Yes, I know I am treading on an age old delicate topic in some churches. If your mix is too loud, it is counter productive. In a worship situation, be sensitive to the Holy Spirit as well as the leadership that is running the event. Just because you are the audio engineer doesn’t mean you should always run it the way you think it should be run. Run sound to the best of your ability but also be willing to do whatever the event leadership wants you to do. You also need to think about what is best in communicating the gospel and mix for your target audience. If it’s younger people, they probably won’t mind it pretty loud. But, if it’s a senior citizen event, chances are that they won’t like subs pounding the room! 🙂 Be respectful, and be sensitive. Volume that is too loud can ruin the mood and can hurt the spirit of worship. In contrast, if it’s not loud enough, it can be a problem too. While I was in college, I toured as an audio engineer for two years with a school sponsored worship band to churches and youth camps. I experimented alot with volume levels while I was on tour and it really does effect the worship environment. If the volume is not loud enough, the worship service can lack enthusiasm and energy. Like I mentioned above, be sensitive to the environment, the leadership, the people in attendance, and to the type of music. If for some reason, after you have tried everything and have done your best with mic positioning and setup, you still have issues with poor sound or feedback, your system equalizer may not be set properly for the room or your speakers. There are ways for the common person to rectify this, but I would highly suggest bringing in a professional. That way you can be sure that no system components will be misused or damaged. Sometimes, the biggest issue is just the tech running the system. This is not meant to bash anyone or put anyone’s efforts down. Training helps, practice improves the sound, technique creates better mixes, but if you don’t have at least a basic technical understand and a somewhat musical ear, then maybe this isn’t the best area for you to serve. Also, a great sound tech must have a teachable and humble attitude. An attitude of servanthood will be a great asset to have behind a mixing console when accompanied by a good technical skill set. I believe audio techs in churches should be auditioned and someone should assess their skill set before they are turned loose. God has gifted each of us differently and uniquely. We are one body with many parts. If everyone was an eye, where would the sense of smell be? If everyone was a sound tech, there would be no worship band, no greeters, no pastors or teachers or small group leaders. So, be honest with yourself. Do you have the skills to do this? Or should you be serving somewhere else? It’s all about effectively communicating the gospel of Jesus Christ. Find the area where you are strong and pursue it with all your heart. I just happened to see this link on Twitter to a website called “Behind The Mixer” which had a post (it’s about two years old) that compared church sound tech’s characters to characters in Star Wars. It made me laugh because of how true it was…lol. Check it out and let me know what you think!! So what are we doing here anyway? The last few years, I have been working alot in production specifically in churches and other Christian venues where the goal is to bring glory and honor to our Lord and Savior, Jesus Christ. It is both a joy and a challenge. The joy comes from knowing that because you decided to step out and give of yourself as literally an offering of worship, that other people will hear the message of Christ’s love and understand more about his love and saving power. The sound tech is helping to communicate the audible message, the lighting tech is helping to create a visual ambience of worship in a given setting or room and also has the power to highlight or mask stage activity, and the projection/video tech helps to communicate through a graphical, lyrical, and through a very visual medium. A tech team at a church is just that, A TEAM!! That means, without one of those members, things don’t flow or move as planned. 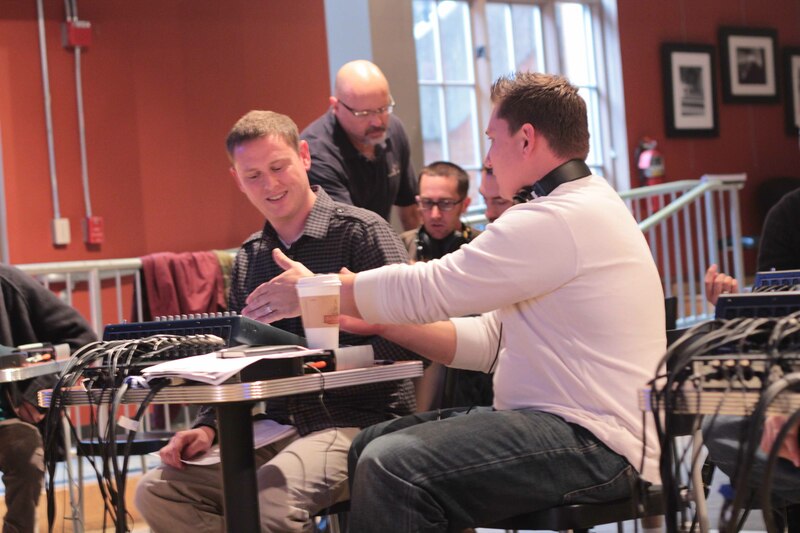 The main three parts of a production team coming together, and working together, helps to create a great atmosphere of worship when things are planned out and worked out right. One important factor that I would like to stress is that each member of that team should be prepared and should understand their roll. Now, by saying that, am I saying that everyone should be spot on and never make a mistake? No! Certainly not…I would just expect someone who is working in that kind of a vital position, understand what they are doing and know how to serve in their position effectively. 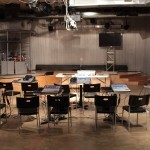 Preparation is a two-fold topic when it comes to working in a worship setting. Preparation includes a certain level of efficiency and technical understanding of their role in production, but it also includes being spiritually prepared. I’m sure we would want the speaker or worship leader to be prepared technically in their message or music as well as in their relationship spiritual with the Lord but shouldn’t that go for the technical staff as well? We, as the technical staff, are in full control of the medium through which the message of God is being communicated through. Shouldn’t we have prepared ourselves and our hearts through time with God and through the reading of His word and prayer before we step into our roles? Yes, most of us have a timeline to work with for production or a run sheet of what is going to happen, but ultimately, God is still running and headlining “the show” and if he decides to come in and mess up your run sheet, then you, as a production tech, should be sensitive to the leading of the Holy Spirit along with the speaker or worship leader, and be technically proficient enough to react to whatever comes. That’s not something that occurs too often in secular production, but in a church, you need to be ready for it if it happens! But, ultimately, the cool thing is that God will work in spite of us if He needs to. Quite honestly, I would rather have Him work through me and in me. It doesn’t matter how technically prepared you are if you lack spiritual preparation. It will trip you up more then you realize. Second to spiritual preparation, is technical preparation. Checking to make sure you know what the order is before service, line checking and sound checking your worship team and speaker mics and BATTERIES, knowing when your lighting cues should be and making sure it’s thought out beforehand, checking lyrics for misspellings and continuity, and making sure cues are in order. Missing cues or parts of a run sheet are not an “unforgivable sin” but they still can be a distraction to worship and to what the Holy Spirit may be doing in someone’s heart. I certainly do not want to be that distraction…but like I said earlier, God will work whether we do all the right things or not. That’s what so great about serving God! Anyway, I’m sure I’ll come back to this topic or a similar topic in the near future. It’s time to go to bed so that I’m ready and prepared for the morning….Sunday morning. A sacred time to worship our Savior, God, Creator and King of all. God bless you as you worship Him in Spirit and in Truth.